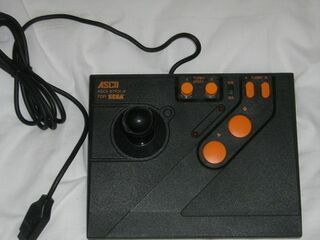 The ASCII Stick α or ASCII Stick Alpha is a joystick manufactured by ASCII for Sega's 8-bit consoles (the SG-1000 II, Mark III and Master System). It is a fairly standard joystick with turbo features, though also allows the user to set the rate at which the turbos fire, as well as switch the function of the A and B buttons. It was only released in Japan. ASCII re-used this basic design a number of times during the 80s, with different colour schemes and names depending on the platform . For example, it is called the "ASCII Stick Engine" for the PC Engine, "ASCII Stick X Turbo" for the MSX and　X68000 computers, and "ASCII Stick Turbo Jr." for the Family Computer.